You gotta organize that stuff. I know, it defies categorization and all that. But you gotta do something about it. Here's a for-instance. Start by identifying an attribute that all objects have: size. Put the little things in jars and the big things in boxes and the long things on hooks (like rakes and shovels and implements of destruction). Here's an example of what to do with all those leftover mayonnaise jars. Just make sure you get the kind with steel lids. The plastic lids are not suitable. 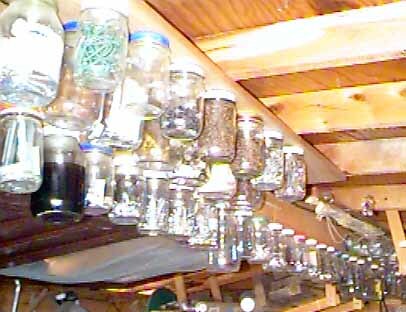 You can put just about anything into these jars -- for instance the second jar in the lower row cotains motor oil. Two coarse-thread "bugle-head" (black) screws per lid, #6, 1" long. Power drill with phillips bit, or power screwdriver. I have not found it necessary to predrill anything. Eye protection is mandatory! (you are working overhead, close to your face, with something very sharp, so don't be stoopid). Next we tackle the boxes. Get a bunch of more-or-less identical boxes. Reasonable possibilities include half-bushel citrus boxes, always a good bet, or tomato boxes. When I can score a dozen or more boxes of one size I am likely to do so, and when I get them home I scrutinize the old stuff to see what boxes are ready to be put out to the dump. There's always something that wants to be reorganized. The rest is easy. 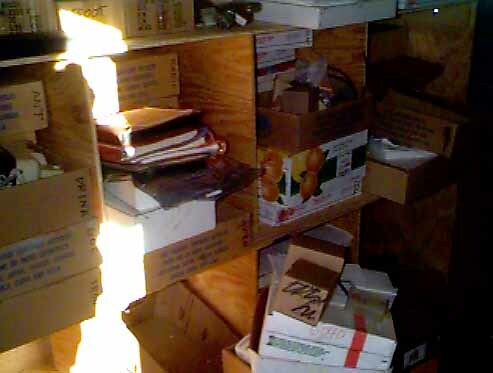 Sort stuff into boxes and stack boxes neatly. Hanging stuff up -- this method works for me: pegboard (masonite with a pattern of 1/4" holes on a 1" grid) mounted on furring strips (so-called 1x2 or smaller) not only gives places to put in peghooks for hanging small tools and gizmos, but also you can put nails through the holes right into the wall for big things like rakes and shovels and implements of destruction. Use 20d (twenty-penny) nails or larger. Picture later, when I can borrow the digital camera again.